Big airblown inflatable spooky Animated Lighted BLACK CAT with TURNING HEAD indoor outdoor yard decoration - 6-feet long and 51-inch tall! Poised and ready to strike, this huge fun family-friendly gothic inspired Halloween yard decoration lights up, after being plugged into any 110 outlet. Best of all, this fearsome feline’s head moves back and forth to wow audiences around the neighborhood! 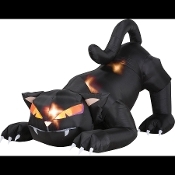 If you're looking for something to set your Halloween yard decorations apart, this animated inflatable scary black cat will do the trick! The Gemmy light up creepy black cat sits crouched and ready to pounce, as its head turns side to side. Cute witch’s familiar lawn prop is an impressive 6 feet in length and over 4 feet high. Includes everything needed for a quick and easy setup and break down. Simply plug into a standard outlet and the cat self-inflates in seconds and deflates for easy storage. Great viewing night or day! Please Note: Products are designed and rated for use in the United States using 120 volt current.